Lately I've been watching TV court religiously. My favorites are Judge Mathis, Judge Judy, Judge Joe Brown and The People's Court. In that order. It's a toss up on the reasons I happen to love courtroom comedy. I get a good laugh at watching folks on national tv, in front of an actual judge, airing their dirty laundry. It's hilarious. Like, piss in my pants hilarious. 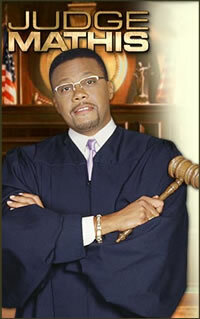 Judge Mathis is my absolute favorite. Maybe it's the glasses or that weird sounding voice or the way he just calls people on their shortcomings. **shrugs** All I know is that he keeps me laughing from beginnig to end. I always agree with his rulings... actually I agree with all these judges rulings. Getting to the ruling is the fun part. And Judge Mathis got jokes. He is always clowning. Okay so I'm watching Judge Mathis the other day and the plaintiff was sueing an ex-coworker for money owed on a loan. The plaintiff stood with his wife and proceeded to tell Judge Mathis how the loan was incurred. In the process he sez the defendant was interested in him sexually. The defendant being male... the plaintiff being male... it was a "Gay" case... back to front. The plaintiff is standing there with his wife while the story is being told. It was hilarious. Judge Mathis asks the defendant, "Is that how things work in the gay community?" "Let's ask an expert. My brother Sam is in the audience. Let's ask him." I just fell out laughing. It was just hilarious. I'm sitting there laughing my behind off cuz the Judges brother is like stark, raving RED. Yes! This man turned RED. And he is stunned and shocked and laughing at the Judges reference to him. If no one knew Sam was gay, now they do... cuz Judge Mathis just blurted his business on national TV. I swear my gut was aching from laughter. So ask me again why I love Judge Mathis and all the other judges on network TV... it's COMEDY.... that's all there is to it... straight gut-busting COMEDY. I saw this episode and I fell out when he called his brother out. Hilarious!